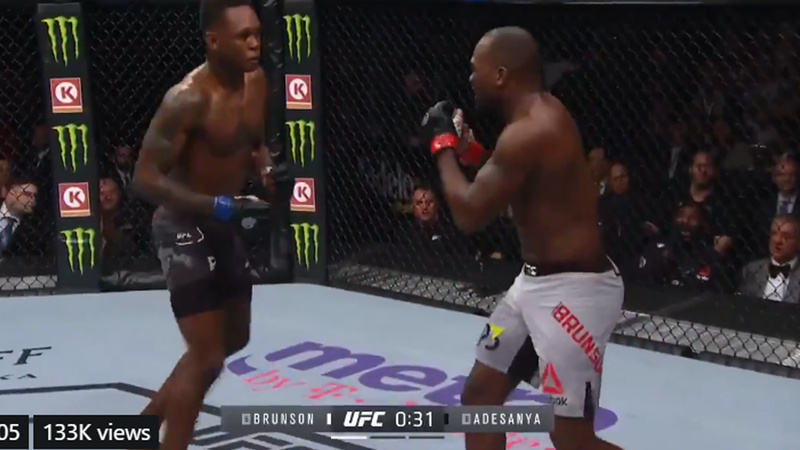 Israel Adesanya and Derek Brunson clashed in a middleweight bout which took place in the main event of UFC 230 tonight in New York City. Undefeated Adesanya entered into the octagon for the first time since scoring a decision win over Brad Tavares in July. Meanwhile, Brunson was looking to rebound after suffering a first-round knockout loss to Ronaldo Souza at UFC on FOX 27 earlier this year. In the opening round, Adesanya immediately takes the center of the octagon, while Brunson clinches and takes the bout against the cage. He tried for a takedown, but Israel nicely defends the shot. Derek pressed Adesanya against the cage and hurled a knee. Brunson also landed uppercuts to the body. He then throws left hook to Adesanya’s head. Referee Herb Dean stepped in and break the action because Brunson was illegally grabbing Israel’s shots. Fight to resume Adesanya lands a punch. Brunson tried a takedown then pushes Israel back up against the cage and lands a hard left hand. Adesanya slips away. He looks for single leg takedown, but it fails to drop Adesanya to the canvas. Israel lands a right hand. Brunson jumps in with a left hand that misses. Israel hurled a nice kick to the body. Brunson moves forward quickly and forces Adesanya against the cage. Israel breaks free and hurled a left hand then a right. He follows up knee and Brunson crashed to the mat. He got back on his feet, but Israel wasted no time and lands another right hand that sends him crashing to the ground. Brunson gets back again but Adesanya drops him again, and the referee stepped in and finished the bout. After the win, Adesanya is 15-0 in MMA. While Brunson has dropped two in a row with a record of (18-7). Next articleJacare Souza Defeats Chris Weidman Via Third-Round KO!